Designing robots that emulate how creatures move and walk helps us not only understand the world around us, but also improve how automatons of the future will get around. But on the other hand, that same research has given birth to this creepy centipede robot toy that squirms around on 18 flailing legs like a tiny mechanised nightmare. Nope. The Japanese company Tamiya is better known for its remote control cars and trucks, but the company also has a lesser known line of educational building toys that teach (or terrify) more than thrill. That now includes this robotic centipede that’s based on the i-Centipot robot developed at Osaka University’s Graduate School of Engineering. As much as I’m creeped out by the wiggly movements of this robotic centipede (yes, I would definitely crush it under foot if it ever came near me), at the same time I’m impressed by the toy’s inner workings. 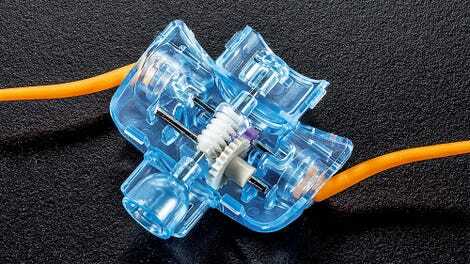 A single motor powers all of the individual moving segments which are connected with universal joints which are responsible for its snake-like movements.